Monthly Charge ¥6,760 (Tax excluded) Unlimited access!! 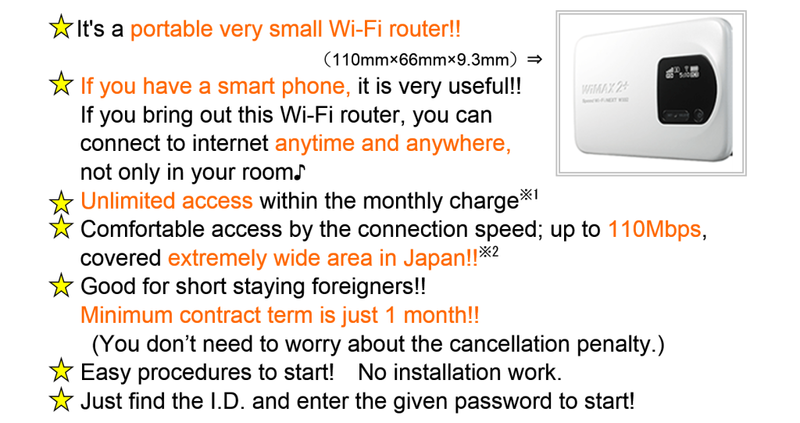 * Only Foreigners can apply for this Internet service. * The internet speeds may slow significantly due to the user environment. * You can get it within 7 days after applying. * Deposit is refundable after return all items. * Not all PCs are compatible. * Maximum communication speeds indicate values based technical standard. We do not guarantee the speed of your actual internet connection. *1 In the case of you use over 3GB for last 3 days, the communication speed will slow down. Downlink will be up to 5 Mbps. *2 Not all areas are covered by this service. *3 We do not guarantee the speed of your actual Internet connection. For more details, please inquire to DID-GLOBAL! !